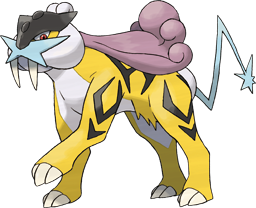 Raikou does not evolve/is not evolved into. X The rain clouds it carries let it fire thunderbolts at will. They say that it descended with lightning. X Die Regenwolken, die es trägt, ermöglichen es ihm, Gewitter zu erzeugen. Es strotzt vor Blitzen. X Le nuage de pluie qu’il porte peut relâcher la foudre à volonté. On dit de lui qu’il est venu avec l’orage. X Las nubes de lluvia que lleva le permiten lanzar rayos a voluntad. Dicen que apareció con un rayo. X Grazie alle nubi di pioggia che ha con sé lancia fulmini a volontà. Pare che sia arrivato con un lampo. X 비구름을 짊어지고 있어서 어떤 때라도 번개를 칠 수 있다. 번개와 함께 떨어졌다고 한다. Y This rough Pokémon stores energy inside its body, then sweeps across the land, shooting off electricity. Y Dieses aggressive Pokémon speichert Energie in seinem Körper und entlädt sie, wenn es über das Land streift. Y Ce terrible Pokémon emmagasine de l’énergie puis court en lançant de puissants éclairs. Y Este duro Pokémon almacena energía en su cuerpo. Después, cuando se desplaza por tierra, la suelta. Y Pokémon violento che accumula energia nel corpo e poi corre all’impazzata, scaricando elettricità. Y 체내에서 들끓는 힘을 전격으로 내보내면서 대지를 달리는 난폭한 포켓몬이다. 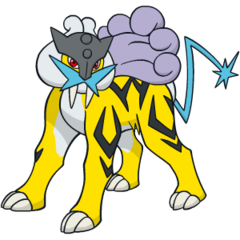 Omega Ruby Raikou embodies the speed of lightning. The roars of this Pokémon send shock waves shuddering through the air and shake the ground as if lightning bolts had come crashing down. Omega Ruby Raikou ist so schnell wie der Blitz. Das Gebrüll dieses Pokémon sendet Schockwellen aus, die wie Donnerschläge durch die Luft beben und den Boden erschüttern. Omega Ruby Raikou incarne la vitesse de l’éclair. Les rugissements de ce Pokémon libèrent des ondes de choc provenant du ciel et frappant le sol avec la puissance de la foudre. Omega Ruby Raikou tiene la velocidad del rayo. Los rugidos de este Pokémon emiten ondas de choque que se esparcen vibrando por el aire y sacuden el suelo como si fueran auténticas descargas de rayo. Omega Ruby Raikou rappresenta la velocità del fulmine. Il suo ruggito crea terrificanti onde d’urto nell’aria e scuote il suolo come se fosse percosso dalla furia di un fulmine durante il temporale. Omega Ruby 번개의 스피드가 깃들어 있는 포켓몬이다. 그 울음소리는 번개가 내리쳤을 때처럼 공기를 떨리게 하며 대지를 흔든다. Alpha Sapphire Raikou embodies the speed of lightning. The roars of this Pokémon send shock waves shuddering through the air and shake the ground as if lightning bolts had come crashing down. Alpha Sapphire Raikou ist so schnell wie der Blitz. Das Gebrüll dieses Pokémon sendet Schockwellen aus, die wie Donnerschläge durch die Luft beben und den Boden erschüttern. Alpha Sapphire Raikou incarne la vitesse de l’éclair. Les rugissements de ce Pokémon libèrent des ondes de choc provenant du ciel et frappant le sol avec la puissance de la foudre. Alpha Sapphire Raikou tiene la velocidad del rayo. Los rugidos de este Pokémon emiten ondas de choque que se esparcen vibrando por el aire y sacuden el suelo como si fueran auténticas descargas de rayo. Alpha Sapphire Raikou rappresenta la velocità del fulmine. Il suo ruggito crea terrificanti onde d’urto nell’aria e scuote il suolo come se fosse percosso dalla furia di un fulmine durante il temporale. Alpha Sapphire 번개의 스피드가 깃들어 있는 포켓몬이다. 그 울음소리는 번개가 내리쳤을 때처럼 공기를 떨리게 하며 대지를 흔든다. Gold The rain clouds it carries let it fire thunderbolts at will. They say that it descended with lightning. Silver A Pokemon that races across the land while barking a cry that sounds like crashing thunder. Stadium2 The rain clouds it carries let it fire thunderbolts at will. They say that it descended with lightning. Ruby Raikou embodies the speed of lightning. The roars of this Pokemon send shock waves shuddering through the air and shake the ground as if lightning bolts had come crashing down. Sapphire RAIKOU embodies the speed of lightning. The roars of this POKeMON send shock waves shuddering through the air and shake the ground as if lightning bolts had come crashing down. Emerald RAIKOU embodies the speed of lightning. Its roars send shock waves shuddering through the air and ground as if lightning bolts were crashing down. Diamond It is said to have fallen with lightning. It can fire thunderbolts from the rain clouds on its back. Pearl It is said to have fallen with lightning. It can fire thunderbolts from the rain clouds on its back. Platinum It is said to have fallen with lightning. It can fire thunderbolts from the rain clouds on its back. SoulSilver A Pokémon that races across the land while barking a cry that sounds like crashing thunder. Black It is said to have fallen with lightning. It can fire thunderbolts from the rain clouds on its back. White It is said to have fallen with lightning. It can fire thunderbolts from the rain clouds on its back. White 2 It is said to have fallen with lightning. It can fire thunderbolts from the rain clouds on its back.